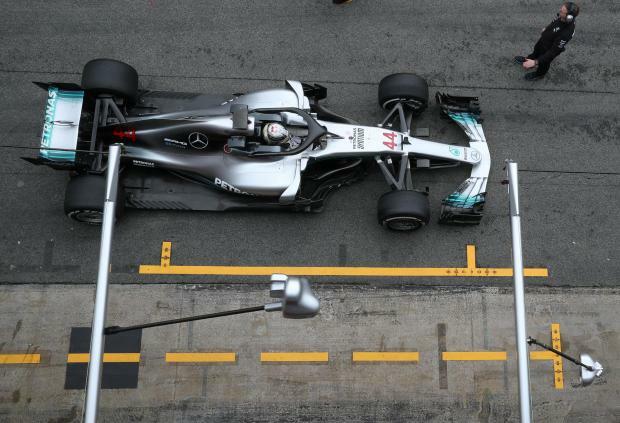 Lewis Hamilton of Mercedes during testing. Formula One wrapped up the first pre-season test of the year in Barcelona on Thursday with four-times world champion Lewis Hamilton back on top of the timesheets for Mercedes. The Briton, who had done only 25 laps earlier in the week after snow and rain wreaked havoc with the schedule, completed 69 more with a fastest time of one minute 19.333 seconds using the medium Pirelli tyres. "I was really happy to get out today, to be honest," Hamilton told reporters at the end of the day's session at the Circuit de Catalunya. "I don't like testing but today I actually was really keen to get out, obviously because we hadn't had many laps... to get a feel for the tyres and warm-up process and kind of stretch the legs a little bit on this new car. The pace of the Mercedes came as no surprise, with the team having won the last four drivers' and constructors' titles, and they already look the team to beat even though testing times can be deceptive. Ferrari's Sebastian Vettel, also a four-times champion and last year's runner-up to Hamilton, has already said that Hamilton and Mercedes will be favourites when the season starts in Australia on March 25. Hamilton said he was not looking at other teams' performance, however. "I don't know what they've been doing," he said. "I've seen a couple of them on track. I've not even seen their livery, I just know it's red." Belgian Stoffel Vandoorne, in the now Renault-powered McLaren after that team's split with Honda at the end of last year, did 110 laps and was second quickest although he was using the much faster hyper-soft tyres. Vandoorne's time of 1:19.854 was still half a second slower than Hamilton's. The Belgian's Spanish team mate and double world champion Fernando Alonso did another 51 laps and was fifth on the timing screens. French driver Pierre Gasly, in the Honda-powered Toro Rosso, did the most mileage -- an impressive 147 laps -- while Vettel completed 120 and was third fastest on a day that started wet but dried out. "I’d have liked to have driven more, but we can do that next week (at the second test), when we will start to get a clearer picture," said Vettel, who spent some time in the garage as mechanics worked on the car. Mexican Sergio Perez had his first taste of the new Force India, after the snow stopped him getting any mileage on Wednesday, and lapped eighth fastest. The second and final pre-season test starts on Tuesday at Barcelona's Circuit de Catalunya.